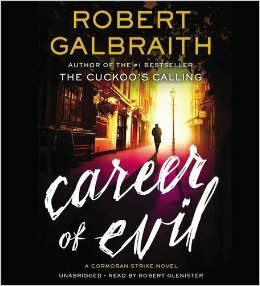 This is the third book in Galbraith's (aka J.K. Rowling) Cormoran Strike series, and here, we have an extremely personal case for Strike and Robin. The book starts off with the very disturbing delivery of a most unwanted package to Robin Ellacott, Strike's resourceful and determined secretary-turned-partner: the severed leg of a woman. What follows is a race against time to find this killer before he finds them, and Strike has not one, but three men in mind who have a grudge against him might have done this. This book is just as complex and riveting as the first two in the series, but the notable thing about Career of Evil is how much more disturbing it is than the first two, which is saying something. Here, we are taken into the mind of a serial killer, and witness his sadistic and sociopathic need to kill and mutilate, all while Glenister dispassionately relates it all in his expert narration. Glenister is truly the perfect narrator; the amount of dialects and accents he uses in this book alone is worth listening to the whole thing, even if the book wasn't so darn good in the first place. One other thing I loved about this book was how we learn more about Robin and her past. In addition, the relationship/friendship between Robin and Strike develops further, and I really enjoyed watching it progress. I will warn you, this is not for the faint of heart; if you get squeamish easily you might want to skip this series. If not, you are definitely missing out on some top-notch mysteries and fabulous narration. If you're an audiobook listener, put these on your list. Disclaimer: I got this audiobook from my local library, wahoo! So glad you liked it! I read it a few weeks ago and was in absolute awe. Probably the best one yet, in my opinion, although those chapters from the killer's perspective were truly disturbing (but that only made it better, in a way). Yay! I loved this book so much as well. The more personal details about Strike and Robin made it SO good. I didn't really mind the gory stuff because the characters were just so great. Good review. Loved this book, each book in the series gets better.